Following these strategies will allow you to have control of your bankroll while giving you a chance to increase your winnings or cap your loss. Additionally, keeping track of certain factors such as teams overall records, ATS records and so on can also be useful. For instance, certain teams do very well at home or on the road whereas some teams will play really good against certain opponents. As long as you take these trends with a grain of salt, you’ll be able to better judge which team should win the game by knowing them. Betting sites like Bet365 will have additional match up info and trends. And lastly, don't be scared to go with your guts. If you follow the strategies stated above, you won't be in too bad of shape if every now and then, you just go with your guts. 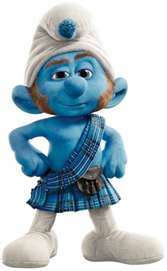 Gutsy smurf has got the guts, do you?